Watch live horse racing from the USA, Ireland and the UK on your phone. View the "Top 10 Backed Horse" to see where the smart money is going. "Racing Post Spotlight" provides the inside line on which horse to back. Get full access to betting offers only available to users of the William Hill app. Place a £10 bet on any horse and William Hill will give you a free £20 bet. With more than 90 years in the business, it’s safe to say William Hill has proven itself as one of the best bookmakers out there. They are continually updating and improving their mobile sportsbook for iPhone, Windows Phone and Android. Horse racing is one of their biggest betting markets, as a result they've put a lot of effort into developing the best possible horse race betting app. Not only can you wager from your phone but you can now also watch live horse racing in HD from the United States and Europe. 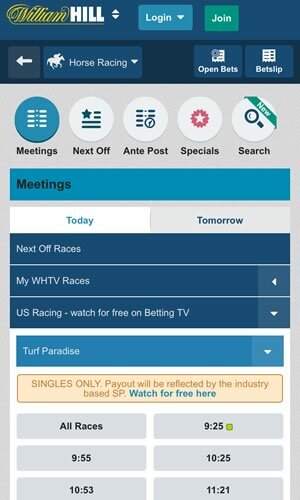 The William Hill racebook app also offers horse racing betting tips and live commentary from racetracks around the world. 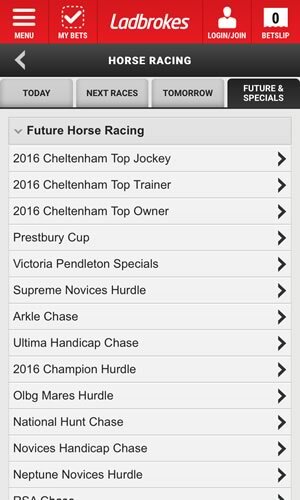 William Hill Mobile has one of the most advanced horse racing sections available on mobile today. Best Odds Guaranteed – William Hill guarantees the best odds on horse races in the UK and Ireland. This is really important, as even minor differences in the price could make the difference in your long-term results. When you register at William Hill, you can get £20 in free bets. Just deposit funds and place at least £10 on odds of 1.20 or higher. 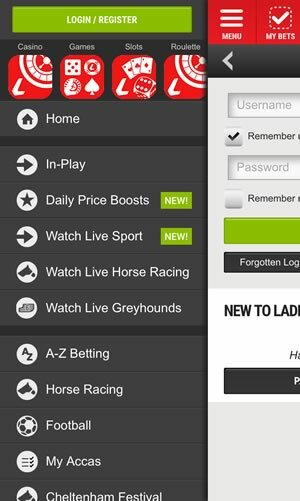 The mobile sportsbook will then give you two £10 tokens for free bets. You have 30 days to use them, so be careful not to let them expire. In terms of horse racing, William Hill regularly launches special offers for big races. Just check their promotions page before betting and see what’s available. Famous races like the Cheltenham Festival, the Grand National, the Ascot Festival provide good opportunities for added value. If you want to bet on other sports besides horse racing, there are plenty of options available via the William Hill betting app. You will find all the biggest football leagues and cups in the world, the US NFL, NBA, NHL, MLB, greyhounds, tennis, rugby, cricket, snooker, darts, and many more. Most of them are available for both pre-game and live betting. 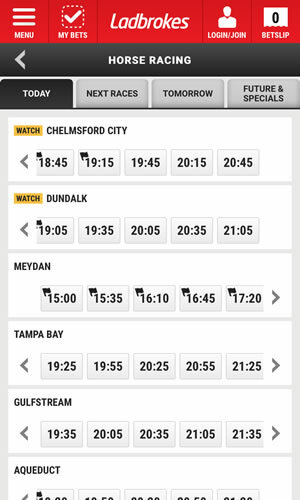 The William Hill mobile app contains everything you will find on their website. The William Hill betting app is available for iOS and Android. For Apple devices, go to the iOS App Store, download the software and install it. If you are on Android, you need to visit the William Hill website since Google Play Store does not allow gambling applications. 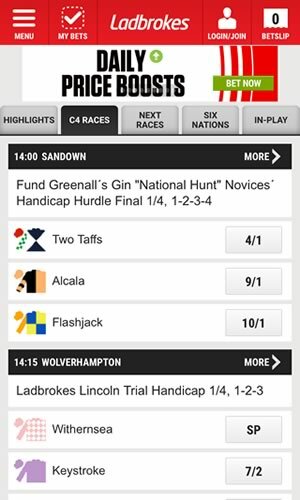 If you are a fan of horse racing, the William Hill app is more than a viable betting option. You will find live betting, cash-out, betting tips and live high-definition streams of horse racing from the UK, Australia, Canada, Ireland, France and the UK. All of that comes with an intuitive user interface for effortless navigation on the go.